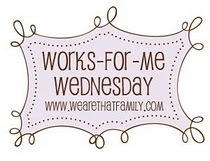 It's Work for Me Wednesday, and this week the theme is "Mom, I'm Bored", so after you read my post hop on over to Kristin's blog at We are Theat Family for all kinds of ideas on how to beat the summer boredom blues. Last week, I shared some ideas with you on how to keep the kids busy this summer without breaking the budget. So this summer our weeks will consist of going to the free movies at least once if not twice a week, going bowling once or twice a week with the Kids Bowl Free program, and of course we will go to the pool at least once or twice a week. Then there is softball, baseball, VBS, and park playdates to keep us busy but even with all of that I will still inevitably hear the words "Mom, I'm Bored". However, I am prepared this year. We have introduced a treasure chest this year as a reward for good behavior, and helping out around the house but I have created a special "Summer Boredom Beater Treasure Chest" for this summer. I have filled it with brand new coloring books, paper doll books, knick knacks needing to be painted, water balloons, games, as well as plenty of other odds and ends that I have found on sale. As the kids get bored we will be turning to the chest for a new activity. They will only be allowed to choose one at a time, and I am hoping that it will help to keep them entertained this summer.